I know Brussels sprouts are a cool-weather vegetable, and you’re only supposed to buy seasonally, blah, blah, blah. But I just couldn’t resist these little vibrant green buds at the grocery store last week. As with most vegetables, I find roasting is the best treatment because a) it’s crazy simple, just place on a sheet tray with olive oil, salt and pepper and bake until crispy on the outside and tender on the inside, b) roasting concentrates the flavor of the vegetables and makes them taste like their best selves. So Brussels sprouts taste more Brussels sprout-y and eggplant tastes more eggplant-y…you get it. 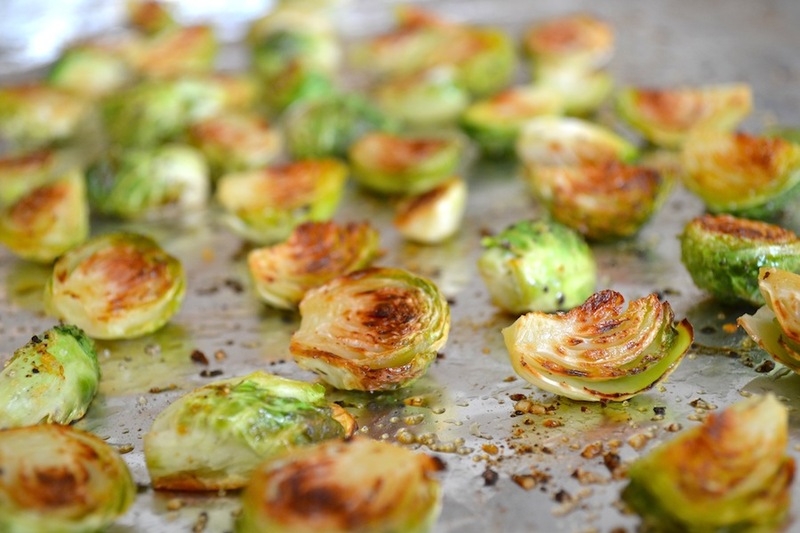 Good if you like a certain vegetable and still good if you (think you) don’t like a certain vegetable because roasting will bring out the vegetable’s best flavor. And then you might change your mind. That’s how I came to love underrated veggies like Brussels sprouts and cauliflower. Anyway, I pretty much already posted the recipe for this (see comment A), but I like consistency so I’ll type it up in my usual format below. One note: when purchasing Brussels sprouts, look for smaller buds that are vibrant green and tightly closed. Avoid those with soft heads and yellowing or loose leaves. Preheat oven to 350 °F. Line a sheet tray with foil or parchment paper and brush with a little olive oil. 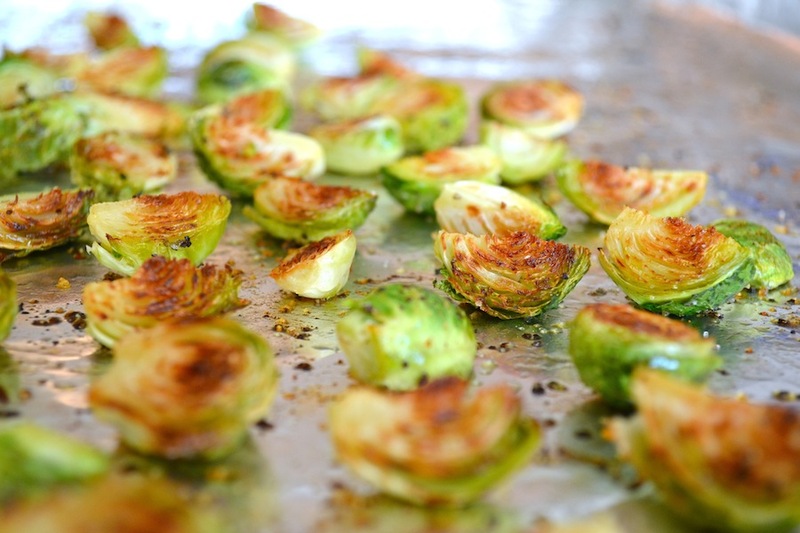 Rinse and dry the Brussels sprouts. Trim any extra part of the stems and remove loose leaves. Larger buds can be cut in half or even quartered. Place on sheet tray in a single layer and avoid overcrowding. Brush with olive oil and then liberally sprinkle with cumin, salt and pepper. Use your hands to mix and ensure the olive oil and seasoning covers all the buds. Roast in the oven until the cut sides are golden brown, the outside leaves are crisp, and the insides are tender. For my oven, this took about 40 minutes. I like cooking salmon, or any fish, really, for weeknight dinners because it cooks so quickly. And, to make it even easier, as with any quality seafood, the best way to prepare it is to keep the recipe simple and let the flavor of the fish come through. This week I made a spice-crusted salmon using a mixture of some of my favorite spices. I used brown sugar in the mixture, which is what created that yummy caramelization you can see on the top of the salmon. To balance the hint of sweet from the brown sugar, I added fresh lemon juice and it gives the salmon a nice citrusy finish. You can use the spice rub I made or create your own using spices you like. Mix the ingredients for the spice rub in a small bowl and set aside. Place the salmon fillets on a prepared baking sheet. Brush olive oil on the top of the salmon and liberally sprinkle on the spice rub. Depending on the thickness of your fillets, bake the salmon for about 15 minutes or until cooked through. When the salmon is ready, the skin will look opaque and the fish will flake easily with a fork. 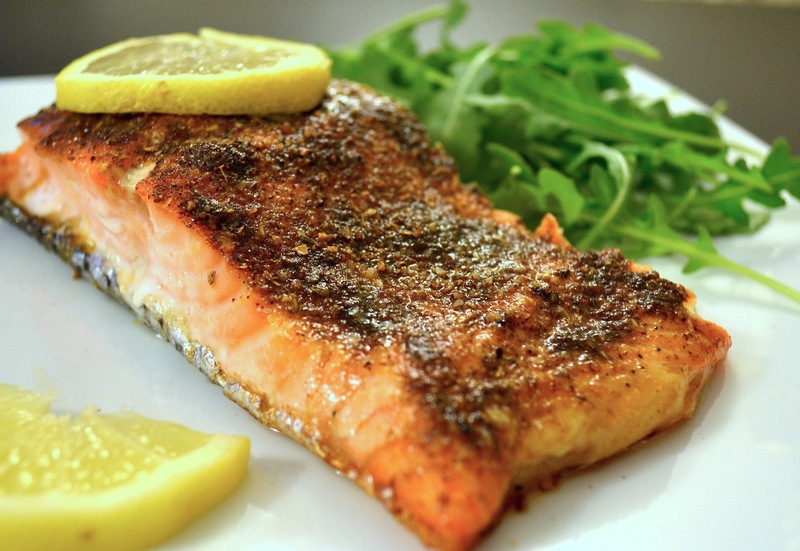 The best way to tell when salmon is cooked is to ensure the internal temperature reaches 145°F. Finish each fillet with a spritz of fresh lemon juice and serve with your favorite side. I made a simple arugula salad and created a vinaigrette using the olive oil, remaining fresh lemon juice, and salt and pepper. This week’s schedule was a little crazy with work events and, to be honest, life in general. I didn’t have a chance to make the spring flatbread I had planned, so I made a simple lunch using the bread and some avocados and shrimp that I had on hand. The best part about this is that you can top avocado toast with almost any ingredient. There are so many variations, it’s hard not to love this recipe. Heat olive oil in a shallow wide pan. While it’s heating, season the shrimp with salt, pepper, and, if you’re using, the Jamaican Firewalk seasoning. Once the oil is heated, place the shrimp in the pan in one layer, avoiding overcrowding. Depending on the size of your shrimp, cook on one side for about 2-3 minutes. Flip the shrimp and cook for about another minute until the shrimp is pink and opaque and cooked through. Remove from pan and set aside. I used small shrimp (41/50) and they cooked in about 3 to 4 minutes total. Cut the flat bread into points, brush with olive oil and sprinkle whole cumin seeds over the pieces. Toast in the oven for about 5 to 7 minutes until golden brown and crispy. Cut the avocado once all of the other ingredients are prepped to minimize browning. I cut my avocados in thin slices and sprinkled with salt, pepper, and red pepper flakes. I also added a spritz of fresh lemon to help cut down on the browning and add a fresh pop of citrus. Another variation of avocado toast involves mashing the avocado lightly and mixing with salt, pepper, and lemon juice and then using as a spread. Both ways are equally delicious. Now you’re ready to assemble. 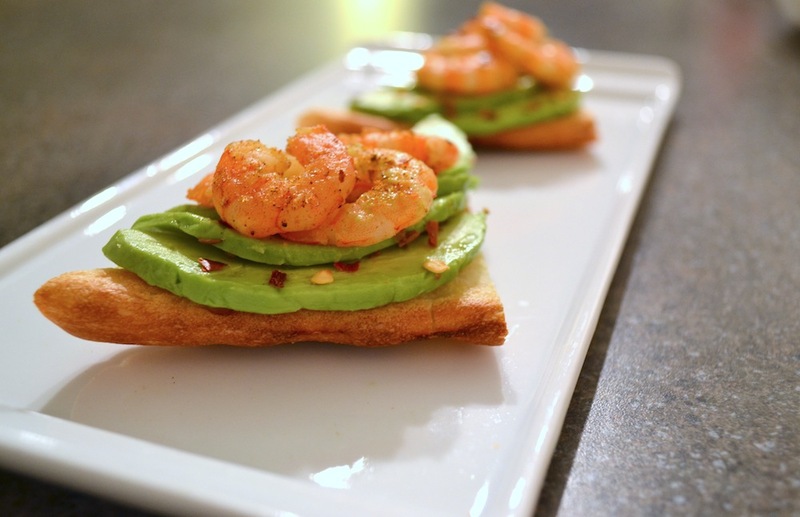 Layer each toast point with slices of avocado and top with shrimp. Finish with another spritz of lemon and serve immediately. Though this dish combines two flavors I normally don’t use in the same recipe, they work really well together here. Sriracha is one of my favorite condiments for just about anything and it pairs perfectly with the honey for a delicious spicy and sweet glaze. I made this on a weeknight last week and served it with some brown rice as a twist on Chinese takeout. It was so, so good. The chicken thighs were tender and flavorful. The sriracha and honey balanced each other out well and each bite had a touch of sweet with a kick of heat. It was even better after a few minutes when the rice soaked up some of the extra glaze from the chicken. Hope you enjoy! Preheat the oven to 425 °F. Place the chicken in a large baking dish. Brush olive oil on the chicken and season with salt and pepper. Place in the oven for 15 minutes to allow skin to brown and get crispy. In the meantime, place the honey, sriracha, lemon juice, and soy sauce in a small saucepan over medium heat. Stir to combine and allow to cook on medium-low heat until the sauce thickens slightly. Take the chicken out of the oven and brush the reduced honey sriracha glaze all over each piece of chicken. Return to oven and cook for about 20-25 minutes more or until the chicken is cooked through and the juices run clear when cut. With yet another impending snowstorm for the D.C. region, most of my plans for this Saturday include the following: my couch, fuzzy socks, a cozy blanket, and various snacks. So far, I’ve started the morning with a little online window-shopping. Check out some of my favorites below. Hope everyone stays safe and warm out there! Eggplant is one of my favorite vegetables, especially when it’s roasted. It’s simple to make and I love the deep, nutty flavor. My favorite part of roasted eggplant is when some of the edges have caramelized and the middles of the eggplant pieces are creamy. When this happens, I have to stop myself from eating it with my hands as it comes out of the oven. I usually roast one each week and use it as a side for almost any dinner during the week. But last Sunday, eggplant roasting took a backseat to Super Bowl (commercials) viewing. 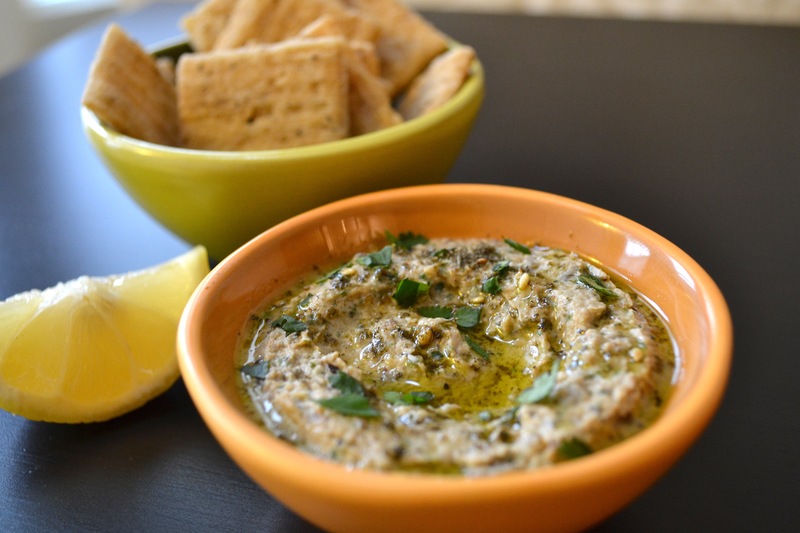 And a few days later my eggplant was a little close to being overripe, which is how this delicious dip came about. Preheat oven to 350°F. Wash and dry the eggplant. Cut into uniform, ½-inch pieces. Place in a large bowl and drizzle with 2 tablespoons of olive oil. Add salt, pepper, and cumin seeds. Toss or use your hands to mix and ensure all pieces are evenly seasoned. Place on a baking sheet and roast for about 35-40 minutes or until the eggplant is lightly brown and soft. Allow the eggplant to cool slightly so you can safely work with it, about 15 minutes. Place cooled eggplant in a large food processor. Add the chopped garlic, lemon juice, Greek yogurt, the remaining 2 tablespoons of olive oil, and cilantro. Season with salt and pepper. Pulse 3 or 4 times to blend, being careful to avoid over mixing. Place dip in a serving bowl. Drizzle with olive oil, garnish with a pinch of za’atar and chopped cilantro. Serve with toasted pita bread or crackers. 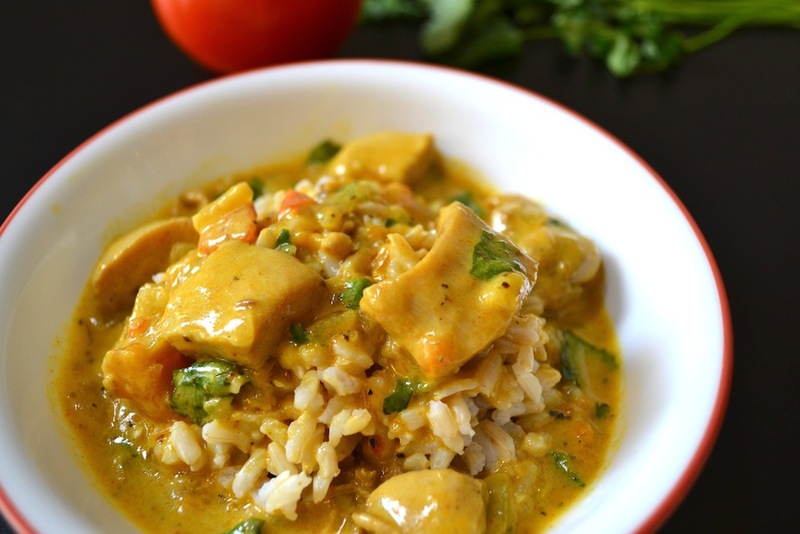 For me, chicken curry is a go-to recipe in the winter months. Served with rice or naan, it’s a hearty, warming dish that’s perfect for this time of year. Heat the oil in a large pot over medium heat. Add in the cumin seeds and allow them to cook until fragrant, about 3-4 minutes. Add the chopped onion and cook until browned, about 10 minutes. In the meantime, chop the tomatoes and reserve ¼ cup. Set aside and place remaining tomatoes in a food processor or blender. Add the garlic cloves, ginger, jalapeno (if using), turmeric, coriander powder, chili powder, and garam masala and puree until uniform. Once the onions have browned, add the tomato mixture plus the reserved ¼ cup of chopped tomatoes to pot and cook for about 10 minutes, stirring regularly. Then add the chicken and mix to coat all the pieces of chicken with the tomato mixture. Cook for about 5-7 minutes. Add the chicken stock to the pot and bring to a boil. Then reduce the heat to medium low and allow to simmer (uncovered) for 20-25 minutes until the chicken is cooked through and the sauce has thickened slightly. 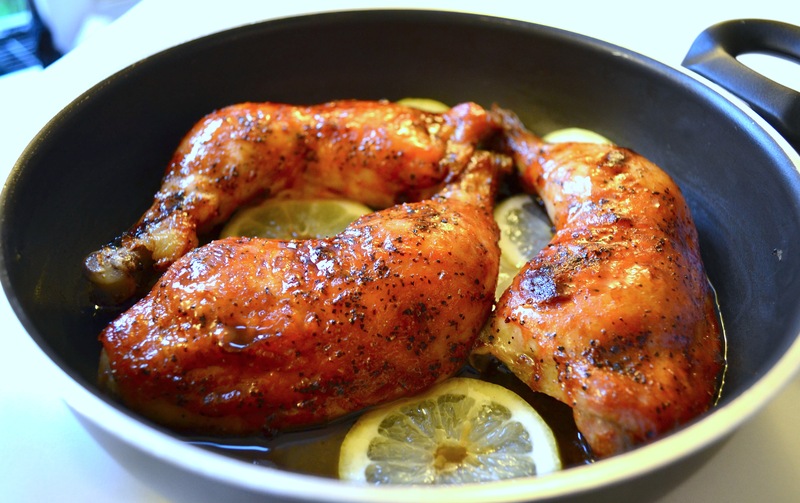 Once chicken is cooked, remove from heat. Slowly stir in the yogurt and chopped cilantro and mix to combine. Season to taste with salt and pepper. If desired, top with additional chopped cilantro for garnish and serve over rice or with naan.